Since we have been inundated with rain lately, I thought instead of griping about it, maybe I would help the children to have fun with it. When we were talking about the rain one of the children said that, "the sun must be sad," since he hasn't been out in a while. So, on Tuesday we participated in some activities that would help us "enjoy rain." What did we have going on? First I had the water table out with sponges, squeezies, and squirters. They had a ball--good thing we had towels on hand. Next, I had watercolor paints and spring pictures. We haven't done watercolor trays a lot this year, but they did very well with wetting their brushes and dipping them in the paints. The children created some beautiful masterpieces. Our craft was a handprint shaped umbrella. I think these turn out cute. Finally, and most important, the children got to play in the mud. Yes, mud. Now, of course, it wasn't as messy as it could have been. We didn't actually go outside and stomp in the mud. I made some mud with dirt and water in a big bin. Then we added some toys (I would have loved to have worms, but didn't have time to get them). The children wore smocks to play in the mud too so that they didn't go home too much of a mess. 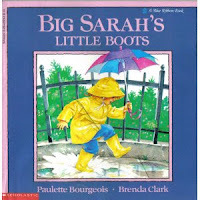 We read one of my favorite books today too, "Big Sarah's Little Boots," by Paulette Bourgeois and Brenda Clark. I think this book is so adorable. It's about a little girl that just loves her yellow boots. One day she wakes up and finds that her boots don't fit any more. She does everything she can to get those boots to fit, but boots don't grow do they? We finished up the day by playing a game where we threw bean bags in a big umbrella. What a great rainy day! That book is one of my favourites too. It's so sweet. Apart from that lovely book, I'm amazed by your creative ideas! Your students must adore you! I'm sure that the kids will look forward to rainy days and wearing their boots and umbrellas after having so much fun! Excellent idea!! I'm sure the children enjoyed themselves a lot!